Blog / Events / Back to Roccatederighi for the Medieval Fair! Back to Roccatederighi for the Medieval Fair! 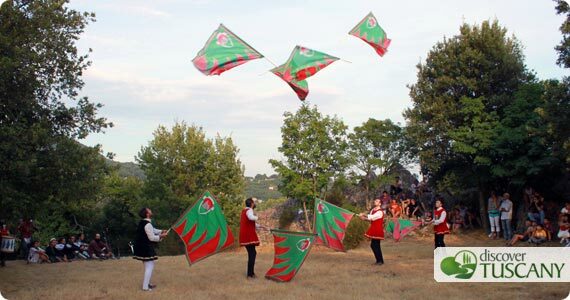 Last Saturday we went back to Roccatederighi to attend the “Festa del Borgo”, the medieval fair held every year in this nice village in the Tuscan Maremma. We were positively impressed: we write about it in more detail on our brand new blog Medieval Festivals. Since we wanted to take our time in seeing the many attractions of the Medieval Fair and visit the nearby Castle of Sassoforte, we decided to sleep in the area for one night. We slept at a nice bed and breakfast near Sassofortino called Podere Usignolo. The owners, Martin and Barbara, are really nice and have created a beautiful place from which one can enjoy the hills of Maremma! We definitely recommend it even for a long, relaxing stay in the Tuscan countryside.